Potholes are the bane of every Canadian’s springtime existence. They drive motorists crazy as drivers attempt to navigate around them. They keep the Town of Amherst’s Public Works crew busy as they work hard to fill them. Potholes are created each year through the regular thaw-freeze cycle, which is the reason they seem to proliferate during springtime. The temperature rises, snow melts, water seeps through tiny cracks in the pavement into the street’s subbase. When the temperature drops, the water freezes, becoming ice that expands, which in turn forces the pavement above it and the ground below it to flex. As traffic drives over the flexing street, the pavement weakens. Eventually, it weakens to the point where the asphalt pops out onto the street. “We usually see the first signs of a pothole when we see alligator cracking on the road,” Lester Fromm, said recently as he and fellow Operations Department employee Dusty Collins worked to fill in potholes on Park Street. The same thaw-freeze cycle can also cause seam separations and frost heaves. 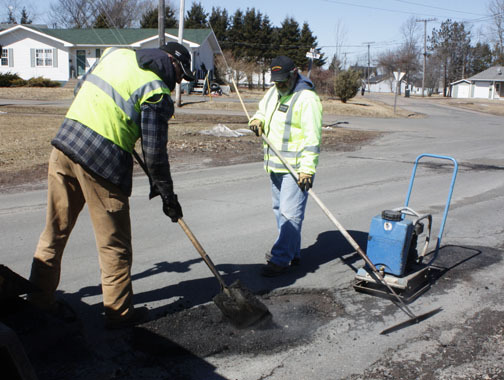 Fromm and Collins have been busy filling potholes with hot, recycled asphalt all winter, but especially since early March. While they and their peers monitor streets for potholes, many are filled as a result of the public reporting them to town hall. “We encourage people to report potholes,” Jason MacDonald, Deputy CAO and Operations Director, said. That’s because reporting a pothole creates a work order, which triggers an inspection of the reported pothole. Then, based on a number of factors - available resources, damage that could occur, size, location and traffic volumes on the street - the pothole is prioritized and addressed. The greater the hazard, the higher the priority to fix it. However, not all potholes need to be, or can be, repaired right away. Some are addressed in other ways, such as with a pylon or a barricade. An example of why potholes can’t always be repaired right away occurred on March 28. The plan was to fill potholes on several streets, but it was derailed when fixing a broken storm sewer on East Pleasant Street became a higher priority. 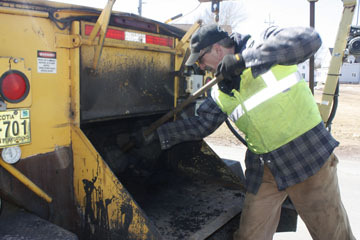 As soon as the storm sewer was repaired, which took most of the morning, Fromm and Collins were back filling potholes. 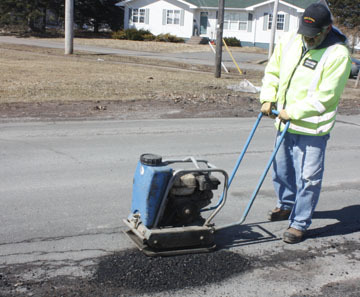 Unlike many other communities that use a “cold mix” to repair potholes, Amherst uses hot recycled asphalt to fill them. The night before the work is to be carried out, cold recycled asphalt stored at the Public Works garage is loaded into a hopper that can be towed behind a truck. The hopper takes about three tonnes before it is full. It is then heated overnight to between 175 F and 200 F, which makes the asphalt look like it just came from an asphalt plant. Batteries on the hopper maintain that temperature as Fromm and Collins work filling the potholes. On this particular afternoon, they filled them on Spring, Willow and Park St. The hopper is pulled within inches of the pothole. Fromm opens a door at the back of the hopper and shovels out hot, steaming asphalt into the pothole. Collins, using a rake-like tool, smooths it out before using a vibrating compactor to smooth it down. These steps are repeated over and over again until several potholes are filled and the hopper is empty. While all the potholes they find on the three streets are filled, most of the delaminations and all of the seam separations and frost heaves are left untouched. That’s because little can be done with them until the thaw-freeze cycle is completed, which is usually around the end of May. The delaminations they did fix were large and repaired in the hopes they won’t turn into potholes. The work can be frustrating because the thaw-frost cycle, combined with the traffic travelling over the fixed pothole, can weaken the repair and the pothole can reform. Fromm and Collins expect they will be fixing potholes on an almost daily basis until around the end of May. Citizens wishing to report potholes can do so by calling 902-667-3352 or filling out a contact form on our website. Citizens can also find more on potholes on our website.